The Hawaii Emergency Management System began working on the campaign in response to increasing public awareness and concern over the repeated launches. JERUSALEM — Three Palestinians died Friday in clashes between Israeli police and protesters after men under the age of 50 were banned from entering one of Jerusalem’s holiest sites. The devices were installed after two Israeli policeman were shot dead at the site, which is known to Muslims as the Noble Sanctuary and to Jews as Temple Mount, last week. Police reported disturbances in the Ras al-Amud, Saladin and A-Tur areas of the city Friday. The Al Makassed hospital said a 22-year-old man named Mohamad Hasan Abu Ghanam had been killed during disturbances in A-Tur. This was confirmed to NBC News by the dead man’s uncle, Kakaled Abu Ghanam. Palestinian activists had earlier told NBC News that a 17-year-old named Mohamad Mahmud Sharaf had been killed by an Israeli settler in Ras al-Amud. The Associated Press said the Palestinian Health Ministry had reported the teen had died close to the scene of clashes but the circumstances remained unclear. Israeli police said they were aware of reports a man had been killed in Ras al-Amud. The Palestinian health ministry later reported a third man had been killed. Reuters cited the Palestinian Red Crescent as stating 41 Palestinians were taken to hospitals or clinics with injures from live fire, rubber bullets and beatings. Earlier Friday, photos showed Muslims praying in the street in front of the police in Jerusalem’s Old City. NBC News then witnessed Israeli border police throw stun grenades towards Palestinians who had tried to push towards a police roadblock. Video footage from the Associated Press, meanwhile, showed Israeli police dispersing protesters in the Ras al-Amud, a neighborhood in city’s east. Police said stones and Moltov cocktails had been thrown at security forces by protesters. Palestinian worshipers run for cover from teargas, fired by Israeli forces, outside Jerusalem’s Old City in front of the Al-Aqsa mosque compound, July 21, 2017. 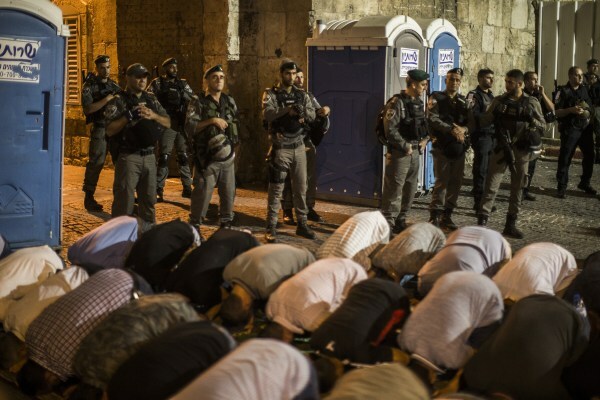 Israeli police barred men under 50 from entering the Old City for Friday Muslim prayers as tensions rose and protests erupted over new security measures at the highly sensitive holy site. “This is not a political issue, but a professional security issue,” Barakat added. Conflicts over the holy site, home to the Al Aqsa mosque and Dome of the Rock which are revered by Muslims, have repeatedly triggered Israeli-Palestinian confrontations over the years. The complex is managed by Jordan and is adjacent to the Western Wall, the holiest site where Jews are permitted to pray. In recent days, Palestinians have protested by praying in the street at the entrance to the site while some have clashed with police. Muslim clerics urged worshipers to skip prayers in neighborhood mosques on Friday and converge on the shrine in an attempt to draw larger crowds. Former grand mufti of Jerusalem Ekremeh Sabri told NBC News by phone that the protesters were refusing to enter “into Al Aqsa mosque through the electronic gates. “I am calling all Muslims to come to the Old City and pray out side. Al Aqsa mosque is ours and just for us,” he added. One Palestinian man told NBC News that he had passed through security but had been prevented from praying next to the Al Aqsa mosque even though he is over 50-years-old. Ahmad Din, 65, said that he had managed to enter the Old City through the first checkpoint but was unable to reach the mosque itself. “They don’t want us to pray not for security reasons it’s political reason,” Din said. The U.S. State Department earlier called for the status quo to be maintained in the management of the site. Police in Jerusalem said Friday that it had information of “extremist elements” that wanted to “violate the law” and was stepping up security around the city. Friday is the highlight of the Muslim religious week, when tens of thousands typically converge on the holy site for prayers. Paul Goldman and Lawahez Jabari reported from Jerusalem. Eoghan Macguire reported from London.